Begun in 2000, this MGNV demonstration garden enjoys a successful collaboration with the Potomac Overlook Regional Park. The Park’s many environmental and cultural activities draw people to the garden, as do school field trips and summer nature camps. The focus of this garden is organic, urban vegetable gardening. Ongoing challenges to successful gardening include the shade of the surrounding tree canopy, and improving the soil. Working in this garden offers experience in propagating plants from seeds, crop rotation techniques, composting, routine garden and soil maintenance, seasonal organic vegetable gardening techniques, and development of community educational materials and programs. An on-site water system, (including a rain barrel) and 20 foot high “wildlife exclusion” fence all support an active gardening program. 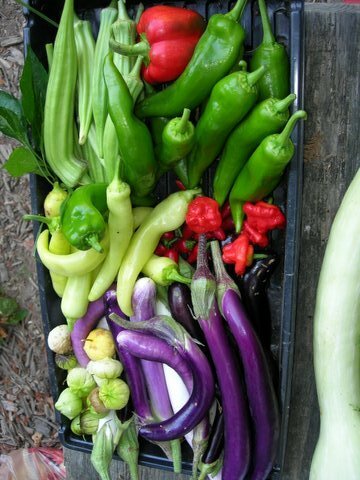 Periodically, the Organic Vegetable Garden will post entries in the Garden Blog section of our website to let you know what is happening in the garden. To read all about it, please check out the Garden Blog section of our website. The Organic Vegetable Garden is located at Potomac Overlook Regional Park, 2845 N. Marcey Road, Arlington, VA. Park in the lot and walk past the Nature Center to the garden.